White has always been a color that has signified innocence and purity. That’s the reason why white is the color associated with angels. And recently, we spotted the ever youthful and chirpy Kajol with her husband Ajay Devgn on Comedy Nights with Kapil. The power couple was on the show just before Diwali in their festive attire. The pretty lady looked gorgeous and she could give any new actress a run for her money. Having said that now let’s take a closer look at what she wore on this occasion. Happy reading! 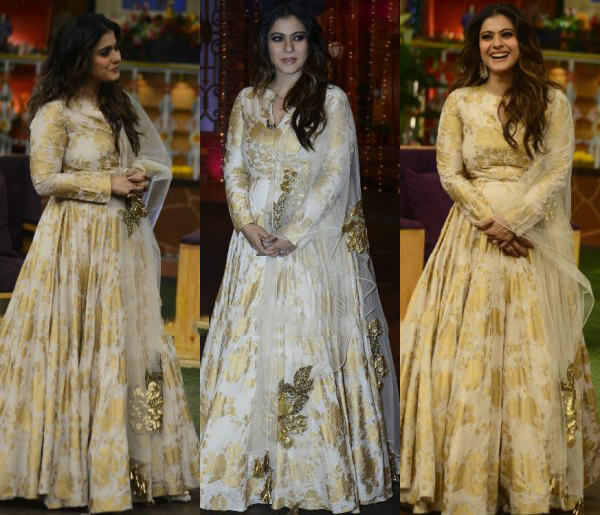 Kajol selected a gorgeous white and gold Anarkali dress. The pretty lady looked like a dream! The golden embellishments made the dress look enchanting. The dress was designed by designer Bhumika Sharma. However, the highlight of her entire look was the beautiful smile across her face! As for hair and makeup, she let her hair down, with the beautiful waves falling over her shoulders. Her makeup was just right with her caramel lip color. We loved the chandbalis she was wearing by Satyani Jewels. Do you love her look as much as we do? Post your thoughts in the comments section! If you like this article, spread the love by sharing it with your friends. Don’t forget to subscribe to out latest style updates. Thank you!